Dan and I celebrated our seventh anniversary yesterday. We decided to go to London for a fun but chilled day. We didn't want to do anything overly touristy so we started off visiting Sloane Square/King's Road and stumbled across the Saatchi gallery which is where the majority of these photos were taken. It was free to get in and we both really enjoyed it; the art was a little bit weird but really good. We then carried on walking and had a mooch around Chelsea before heading to Covent Garden. We really wanted to go to Five Guys as it's new and we LOVED it in America. It's a little pricey for your average fast food but it's amazing; the 'little' burgers and 'little' chips aren't very little and I love to go for the Cajun chips. The drinks machine has about 50 flavour variations of your usual Fanta, Sprite, Coke etc so we couldn't help but try loads of different ones; my favourite was the Peach Sprite, mmm! Off we trotted to Oxford Street as Dan wanted to exchange some Topman jeans and I wanted to hunt down Monki. I bought a lovely jumper which is making me want the weather to get cold, oops! We then wanted to chill a bit so headed for Green Park which was really lovely in the sunshine and we enjoyed people bitching watching before heading to spy on the funny soldiers at Buckingham Palace. By this point we were starting to get hungry so we got the tube back to Covent Garden and went to Maxwells; it's not the most amazing place but they have good food and cocktail deals so we decided it was the best for us yesterday. I hope you don't mind the rubbish photo quality, I didn't fancy lugging my big DSLR around with me so I took my point and shoot which is amazing for vlogs but not for photos I've realised, doh! Overall we didn't go crazy but we had a lovely chilled out day in busy London. It's really nice to try and find new places there rather than going to the typical spots. I have more places I want to check out so we'll just have to go back! I will be uploading an outfit post from this day soon so watch out for that. Looks like a fabuloussss time! Your hair is looking so lovely, jealous! Monki is always one of my first stops when in the big city! Congrats on your anniversary, you're a very cute couple! Looks like you and the boy had a brilliant anniversary, Five Guys is on my must visit list - especially after seeing your pics! Your day looked fun and perfect. Gallery looks ace! Congrats in seven years... Wow! 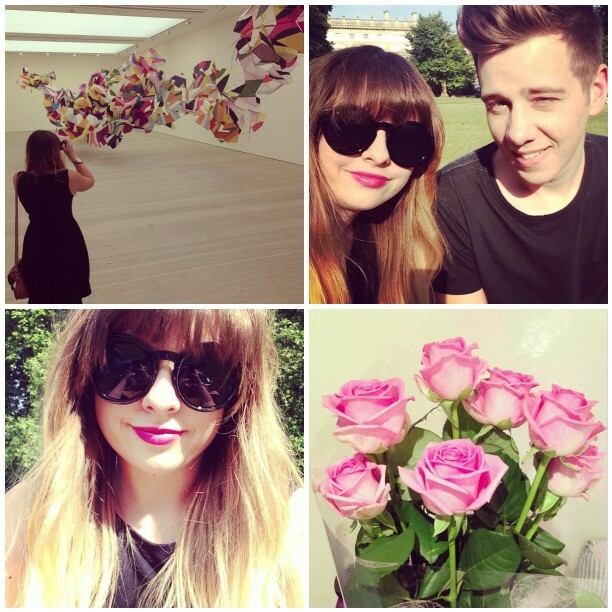 Looks like you guys had a perfectly chilled day out in London! Wow, 7 years is incredible! And I believe we're around the same age...I can't even keep a commitment to my hair stylist for next week! Congrats, and you look like a total doll in that first picture.